A simple way to read and write audio and video files in C using FFmpeg (part 1: audio) | ad hocumentation • n. fast, instinctive documentation of ideas and solutions. C is my favourite programming language and the one I use most often. However, I have tended to shy away from using it for quick one-off signal processing tasks where I needed to read or write audio or video files because it always seemed like a lot of hassle figuring out which library to use and what functions to call to actually get access to the raw data. Recently though, I’ve found a new way of dealing with audio and video files that is relatively painless, so I think it’s worth sharing. The article describes using FFmpeg to read and write video frames in Python and there’s a link to a second article showing the same thing for audio. The basic idea is to launch FFmpeg via a pipe, which then converts raw samples to the required format (for writing) or decodes the file into raw samples (for reading). It may seem like a bit of a hack, but it’s surprisingly effective and, provided that you can figure out the correct FFmpeg command line, extremely adaptable. FFmpeg is described on its project web page as “[a] complete, cross-platform solution to record, convert and stream audio and video.” That’s a pretty accurate description. So far, I haven’t needed to read or write any file format that it couldn’t handle, although in some cases it did involve some googling to figure out the required command line arguments. The following example creates a 1-second long WAV audio file (PCM, 16-bit signed integer samples, 44.1 kHz sampling frequency). The sound is just a loud 1 kHz sine wave. I used the fixed length int data type int16_t for the audio buffer just to make absolutely sure I got 16-bit signed integer samples. That type is defined in the stdint.h header file. You can use a different data type, provided it matches the format your writing. In the single-line for loop where I generate the sine wave, I used M_PI which is actually just the value of π (the mathematical constant). M_PI is defined in the math.h header file. Because I used M_PI, I had to link to the math library, which is why the suggested compiler command line includes the -lm option. The popen() function launches a separate program which is accessible via a “pipe” using C’s standard file i/o functions. The first argument to popen is the command line for the program being launched (in this case FFmpeg). The second argument to popen specifies whether we’ll be reading data from that program through the pipe or vice versa. In this case, the second argument is "w" which means that we’ll be sending data to FFmpeg through the pipe. The return value from popen is a file descriptor for the pipe. In this example, the fwrite() function is used to send the entire contents of the audio buffer into the pipe. Finally, the pclose() function is used to close the pipe. The first argument to the popen() function is a string containing the full FFmpeg command line. The specified options included in that command line control how FFmpeg will interpret the raw sample data it receives through the pipe and the type of file it will write. The "-y" option tells FFmpeg that it can overwrite the specified output file if it already exists. The "-f s16le" option tells FFmpeg that the format of the audio data it reads (from its standard input, which means via the pipe from our program) is raw PCM, signed integer, 16-bit and little-endian. The "-ar 44100" option tells FFmpeg that the sampling rate (i.e. sampling frequency) of the audio data it reads is 44.1 kHz. The "-ac 1" option tells FFmpeg that the number of channels in the audio data it reads is 1. The "-i -" option tells FFmpeg to read its input from standard input, which in this case means from the pipe, since FFmpeg was launched by popen. Finally, beep.wav is the output filename FFmpeg will use. The following example reads 20 ms of samples from the beginning of a WAV file called whistle.wav (click it to download the file), then prints the sample values to a CSV file. The WAV file format is 16-bit signed integer samples, mono, with a sampling frequency of 44.1 kHz. // Open WAV file with FFmpeg and read raw samples via the pipe. 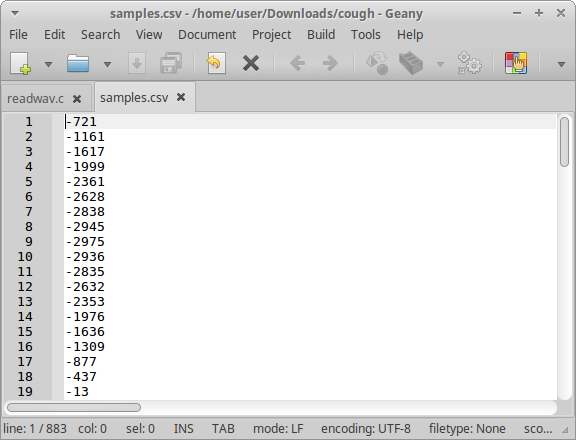 A screenshot of the resulting CSV file, samples.csv, open for viewing in my text editor is shown below. The FFmpeg command line specified in the first argument of the popen() function tells FFmpeg to read its input from the file whistle.wav (the exact format will be detected automatically) and write its output to stdout as raw samples (16-bit signed integers, little-endian). The second argument to popen is "r", which means that our program will read FFmpeg’s standard output via the pipe (it was the other way around in the previous example). To ensure that the raw samples coming from FFmpeg are the correct size for my audio buffer, I specified "-f s16le" as a command line argument to FFmpeg. This was actually redundant in my case, because the WAV file I happened to be using was already in that format. I decided to explicitly specify the format anyway, just to show that FFmpeg can convert to a specific format if desired. This example reads, modifies and writes a WAV audio file. It actually launches two instances of FFmpeg. One opens the original WAV file ("12345678.wav") and passes raw 16-bit signed integer samples into this program via a pipe. The other receives modified samples from this program via a second pipe and writes them to another WAV file ("out.wav"). The modification that is applied to the samples is a simple tremolo effect (modulation of the signal amplitude). // data passes between this program and FFmpeg through a pipe. Click here to continue to part 2, where I show how to apply the same approach to video processing. This entry was posted in Uncategorized and tagged audio, audio processing, C, command line, ffmpeg, format, gcc, MP3, pclose, pipe, popen, raw, reading audio, samples, signal processing, stdin, stdio, stdout, video, video processing, WAV, writing audio. Bookmark the permalink. Can you please send me an exemple including code plea?